To be replaced with an image from Wikimania! Behold! our many, darling, youngling projects. English and German-language beta-versions of Wikinews started in December 2004. Now there are Wikinews versions in 14 languages. The last versions which have started were Serbian and Japanese. The three largest ones are English, German, and Polish. In August 2005, 1.000 users were registered on de.wikinews. After adjusting the article namespace, the German version draws near the milestone of 2.000 articles (1689 articles on August the 4th). News sites and blogs reacted sceptically towards Wikinews right after its start (an example). One of their main arguments was that the Wiki-principle will not work on a news site. At an encyclopedia, such as Wikipedia, articles can be developed and improved without any pressure of time. This is unlike news sources, where an article has to be published close to the event the article is about. Furthermore, they noticed the lack of original reporting in Wikinews. Because Wikinews cites news agencies and articles from mainstream news sites like BBC News or CNN as sources, it could not (yet) be considered as an alternative news source. However, de.wikinews has made a positive development. The number of new articles written per day has increased. According to Erik Zachte's statistics there were more articles written per day on de.wikinew than on en.wikinews for the first time in June 2005. Moreover, the quality of the articles is quite solid. Events which play a major role in the coverage of the mass media are covered by Wikinews, too. Besides, users have established coverage of events and topics which reflect their interest. Compared to most other news sources, users decide which events they cover, answering their personal interest and not the brief of an editorial staff. This could lead to an interesting and multifaceted range of topics as the community grows. Events which received massive public interest and media coverage, such as December 2004 Earthquake in Southeast Asia and the London bombings, have especially shown that a wiki works well as a news site. Many users participated in the collaborative and fast process of writing and improving the article. Blogs and news sites have commended these articles because they were written from a neutral point of view, were matter of fact, and gave a good overview. An advantage of Wikinews is that it can be used as a free news archive. Since the first writing contest on the English version was a success, helping to increase the number of new articles per day, there will be an international writing contest soon. To spread articles containing original reporting through different versions of Wikinews, WORTNET was created. The article OhmyNews citizen reporters meet in Seoul, Korea, about a citizen reporter meeting, in which Erik Möller participated for Wikinews, was translated into Dutch, German, French, and Spanish. Dresdener WOBA soll verkauft werden - Mieter verbittert is an example for original reporting content on de.wikinews. Wikinews finally decided of a licensing scheme ! The Creative Commons Attribution 2.5 License was the most supported license in the recent poll at <http://meta.wikimedia.org/wiki/Wikinews/Licensure_Poll>. Brion has changed the site settings, so the meta data of the wikis should state they are now CC-BY. However, manually created pages such as http://en.wikinews.org/wiki/Wikinews:Copyright will need to be updated. MediaWiki namespace pages may need changing if they had been edited previously. Pages that might need changing include: MediaWiki:Copyright, MediaWiki:Copyrightwarning, MediaWiki:Copyrightwarning2, MediaWiki:Copyrightpage, Project:Copyrights. There's more coming, don't worry. Self-help gurus have helped themselves to our free content, including Approval Addiction: Overcoming Your Need to Please Everyone (ISBN 0446577723). Some authors have less of a hold on the English language than others. Marci Hamilton referred to the Simple English Wikipedia for information on terrorist, referenced in her book God vs. the Gavel: Religion and the Rule of Law. Simple English Wikipedia is meant solely for translators and those who do not know English well, such as EAL learners, children, and the mentally challenged. Perhaps most interesting of all the books was Morgan Spurlock's May 2005 fast food exposé Don't Eat This Book: Fast Food and the Supersizing of America. While he's accused of sensationalism is much of his work, Spurlock has instantly become one of the most profilic documentarians in the world. This is very much so true. The seed is giving fruit: after the creation of Wikimedia Deutschland and Wikimedia France, local chapters are flourishing throughout the world. After the creation of Wikimedia Italia in June 2005, it is the turn of Wikimedia Polska (Poland) to take flight. In the boiler, Wikimedia Srbja (Serbia), Wikimedia Brasil, Wikimedia United Kingdom, Wikimedia România and Wikimedia CH (Switzerland). In order to keep in touch with these exciting new comers, the Wikimedia Foundation appointed Delphine Ménard as chapter co-ordinator. The position, defined during a board-local chapters meeting during Wikimania includes the following tasks: working with the Chief Financial Officer on financial matters concerning the chapters and acting as a liaison between the Foundation Board and local chapters by ensuring information flow. The chapter represents the Polish and Cashubian Wikipedias and other Polish Wikimedia projects. The act forming the association was signed by 26 Wikimedians during the Wikimedia Polska 2005 Meetup in Kraków, which took place on August 14, 2005. During the Meetup we have adopted our preliminary version of our bylaws, elected the association's authority bodies (The Board, Revision Committee and Internal Court) and discussed the future shape and goals of the Association. After some negotiations with the Wikimedia Board we have made several changes to the preliminary version of the bylaws. Now (08.09.2005) all paperwork is finished and the application for formal registration was sent to the Registration Court in Lodz, on September 16, 2005. Although the Association is in its organisation phase, we have already started our wiki-based webpage , mailing list  and IRC channel. Feel free to contact us through any of those media. Sony Center at Night, Berlin. Edgeler, Graeme. "Wikis at the Gate: Academics dissent over use of Wikipedia." Canta. October 24, 2005. "An increase in students using the on-line encyclopaedia Wikipedia in essays and research papers is causing concern among academics… [Victoria University law lecturer Dean] Knight is concerned that Wikipedia "should not be used as a shortcut for actual research," but recognises that it may be appropriate to cite Wikipedia "where qualifications as to its integrity are less important."" More coming Canadian press contact Nicholas "user:zanimum" Moreau recently filmed a segment on the G4TechTV show Call for Help, on 19 October 2005. In the five-or-so minute interview with host Leo Laporte, Nick discussed many benefits and issues surrounding the project, though he lacks any specific memories of what was discussed. Laporte was extremely supportive and positive about Wikipedia; his radio show is actually supported by a wiki-based site. While Wikipedia has been mentioned on a few shows, both as an example and a source of more information on the topics discussed, the previous time Wikipedia was discussed at length was show 71, first aired September 16, 2004. The episode will first air in Canada on November 12, and then debut in the weeks after in the United States and Australia. whole section --> pg 5? Wikimania 2005 - The First International Wikimedia Conference was held in Frankfurt am Main, Germany, from 4 August 2005 to 8 August 2005 at the Haus der Jugend (Youth Hostel). It gathered 380 participants (speakers and attendees) from more than 50 different countries and representing all continents. Over three full days of conference on various topics, Wikimania provided an opportunity to meet and talk with people at the forefront of the Wikimedia communities and wiki software development. Researchers and speakers presented studies and experiments on Wikipedia and other projects operated by the Wikimedia Foundation, on wiki culture and technology, and on the world of free knowledge. The programme included a range of presentations, workshops, and tutorials, aimed at newcomers and oldtimers alike, to give for the first time a concise overview of the current state of research on wikis and free knowledge projects. An endless deployment of press, both German and international, covered the event. More than 120 journalists, from the major newspapers, the main national TV channels and a good number of radios were there, keeping participants and speakers equally busy with interviews. needs updating post-decision... in next iss. While various international bids for locations in the UK, Canada, and Romania have been proposed, only one bid has been formally submitted as of September 8, 2005. Wikimedians from Toronto, the provincial capital of Ontario, and largest city in Canada, is proposing the University of Toronto be the site of the second annum of the event. Kalø Castle in Denmark, build in 1313. Westminster Tube station on the London Underground. Buddha figure overgrown by fig in Wat Mahatat in Ayutthaya historic park, Thailand. Root Canal procedure: unhealthy tooth, drilling, filing with endofile, rubber filling and crown. A bee collecting pollen at the Del Mar fairgrounds. 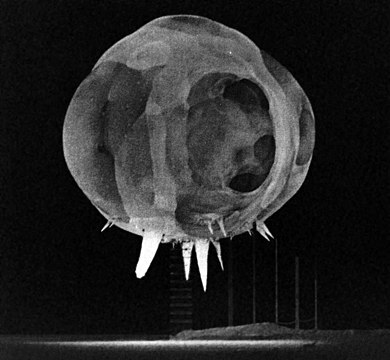 Nuclear detonation from the "Tumbler Snapper" test series. Costumed musicians in New Orleans during a Mardi Gras festival, 2003. A Sawfly orchid in St. Elm, Mallorca. 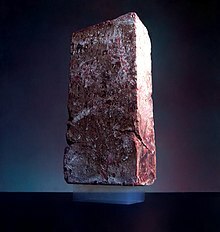 A 2.5 kg brick is supported on top of a piece of aerogel weighing only 2 grams. Schematic illustration of an egg. 180° panorama of Alhambra court yard. Cherry tree in spring bloom. When the Creative Commons project published its first licenses in December 2002, it finally brought a sense of unity behind the free content movement. Instead of many scattered licenses, creators now have the option to pick the right license for their work using a simple tool. They only have to answer basic questions like: "Allow commercial uses? Allow modifications?" They may rule out other basic uses which you want to allow. Hopefully, Creative Commons will contribute to the effort of educating content creators that the seemingly simple choice of forbidding commercial use is not so simple at all. Erik Möller 2005. This article is in the public domain. Feel free to use it for any purpose. It is also a living document whose editable main copy resides at http://www.intelligentdesigns.net/Licenses/NC. You are encouraged, but not required, to include this notice. This page was last edited on 3 January 2007, at 21:46.